All over the world the Adriatic coast is well known for its sunny beaches and excellent tourism, it is really an ideal environment for family vacations, ideal for sailing, renowned for the variety of seafood dishes, and a must for all yachting enthusiasts. Adriatic coast is one of the most beautiful in the whole world; the medieval cities mingle with the modern night life, the sunniest beaches in Europe change in the evening in a cultural heritage full of concerts, theater, and performances. 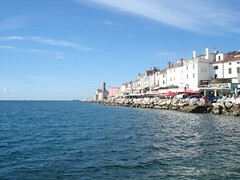 Slovenia has Portorose, Piran, Koper, and Izola as the main Adriatic Coast resorts. 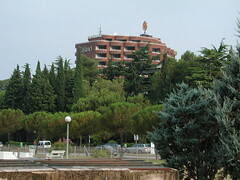 The Adriatic coast with its charming Mediterranean towns, the Secovlje salt works, first mentioned in the 13th century, with nearly 200 bird species, and Portorose (Portorož), mentioned in 1251, which offers numerous modern hotels with congress halls, a fully equipped marina, a sport airport, thermal baths, a casino, and many summer entertainment, cultural, and sport events. Panoramic view of the Adriatic Coast of Slovenia. Music: Giuseppe Tartini. The Slovenian coast is an attractive tourist region, considered to be the cleanest and most beautiful in Europe with many ports; in fact it is one of the sunniest parts of the Mediterranean. It is relatively close to the major towns in Europe, it can be quickly accessible from neighboring states, with many ways to travel to.